The Global Precipitation Measurement mission or GPM core satellite analyzed Tropical Depression 9 after formed in the Gulf of Mexico after a slow crawl over the last week. The frequency of tropical cyclone formation has definitely increased in the Atlantic Ocean basin. A tropical wave that the National Hurricane Center (NHC) had been monitoring for development since it left the African coast almost two weeks ago was upgraded to Tropical Depression Nine (TD9) on August 28, 2016. The low pressure became a little better organized after moving into the Florida Strait and that led to the upgrade. 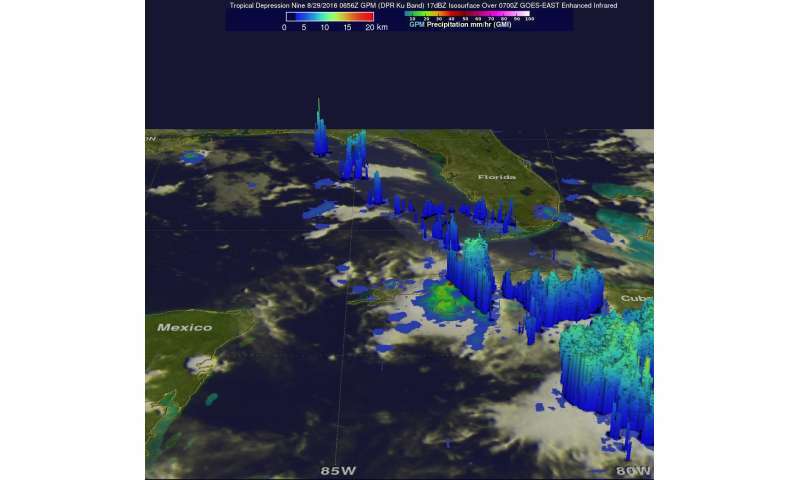 The GPM core observatory satellite passed above the still relatively poorly organized tropical depression on Aug. 29 at 2:56 a.m. EDT (0656 UTC). Maximum sustained wind speeds were estimated to be only 34.5 mph (30 knots). Since then deep convection associated with the tropical cyclone has increased. Rainfall measurements within TD9 were derived from GPM's Microwave Imager (GMI) and Dual-Frequency Precipitation Radar (DPR) instruments. These measurements showed that precipitation was intense in convective storms over the western side of Cuba. GPM revealed that some showers were coming down at a rate of greater than 7.6 inches (193.514 mm) per hour. GPM's radar (DPR Ku Band) data were used to examine the 3-D structure of precipitation within storms associated with TD09L. Most thunderstorm tops around the tropical depression were found to reach heights of less than 8.7 miles (14 km). However, GPM's radar found that some storm tops in powerful convective storms in the Caribbean Sea south of Cuba were pushing up to heights above 9.9 miles (16 km). At 11 a.m. EDT (1500 UTC) the center of Tropical Depression Nine was located near 23.6 degrees north latitude and 84.3 degrees west longitude. That puts the center about 170 miles (275 km) west-southwest of Key West, Florida and 125 miles (200 km) west-northwest of Havana, Cuba. The National Hurricane Center (NHC) said that the depression is moving toward the west near 7 mph (11 kph). A turn toward the west-northwest is forecast today, followed by a slow northwestward motion on Tuesday. A turn toward the north is expected Tuesday night. On the forecast track, the center of the depression will be passing north of the north coast of western Cuba today, Aug. 29, and moving farther into the southeastern Gulf of Mexico tonight and Tuesday, Aug. 30. The estimated minimum central pressure is 1007 millibars. Maximum sustained winds are near 35 mph (55 kph) with higher gusts. Some strengthening is forecast during the next 48 hours, and the depression is likely to become a tropical storm later today or tonight. The NHC predicts that TD9 will become a tropical storm in the Gulf of Mexico this evening but moderate vertical shear over the next couple days is predicted to keep the tropical depression from significantly strengthening. TD9 is expected to move toward the northwest for a couple days and then made a turn toward the northeast. It is then expected to pass over northern Florida as a strong tropical storm.